We have been designing eLearning for quite some time now, but this blog post from Canva made us realize that great design is actually simple to create if you follow a few rules. So we thought we will spill the beans and let the world (the other eLearning designers who are still fumbling with the rules of the game) know about the 9 essential design tactics that will magically transform ho-hum eLearning courses into scintillating works without compromising on instructional effectiveness. Is there a visual focal point? Your learners are busy people. Besides, they are used to being wooed by smart ads, snazzy infographics, and clever YouTube videos. So you have to make sure that your course not only grabs eyeballs but also keeps the learners hooked. Create visual focal points that cries out for attention. Tip: Ask a co-worker to look over your course. Then ask him about his first impression. If he was bored or was distracted by a blog or his smartphone, then you need to rethink your design. Is there an obvious and logical continuity? Cluttered websites where you cannot find links. Shopping malls where the elevators, escalators, and exits are hard to locate. Neighborhoods where the numbers of the houses don’t give a clue about their locations. These are common examples of bad designs that make getting around and doing things difficult for us. If you are not careful, your eLearning course can also turn out to be such a design nightmare for learners. Chunk and sequence the content first. This helps you figure out how you will place the various elements on screen, so they follow a natural and logical sequence. Arrange graphical elements so that they direct learner attention to the content and through it, not away from the screen. Build gaps into your design or space out the elements, so the learner can pause and let the content cement in his mind. Meanwhile, here are some more pointers on how to create an effective and enticing visual design flow. Do the different typefaces gel with one another? Use a serif and sans serif fonts in titles to create contrast. Choose typefaces that match the mood and the personality of the content. Choose typefaces that appeal to the sensibilities of your audience. If you are unsure, choose simplicity over novelty. Here are some more tips on how to choose a typeface for your course. Have you ensured there are no readability issues? Choose the right size for the text. Choose readable fonts. Don’t sacrifice readability to create contrast. Here are some tips on how to pair fonts to maintain balance between readability and quirkiness. Choose font and background colors so that the text stands out. Be careful of column length. Many learners feel overwhelmed when they are made to read large chunks of text that run right across the width of the screen. You can create narrow text boxes or space out the text across multiple columns (newspaper style) to create an illusion of sparseness. Create a unifying theme that runs throughout the course. Choose a scheme for fonts, colors, and templates so that every page looks like it is a part of the same course. Do not overlook seemingly inconsequential elements like buttons, heading sizes, and spacing. Every element on the screen should adhere to the theme. Create a standards document for every project. This ensures team members working on a project are on the same page and know how creative they can be so that they do not end up creating wildly different designs. Is there contrast between different visual elements? We had been harping on harmony and balance, but contrast is also a critical design strategy in eLearning. Apart from creating points of interest that hook learner, contrast also enhances instructional effectiveness. Do form and function balance? As an eLearning designer, you don’t want to be known as someone who creates beautiful courses that don’t deliver substance. In an all-out effort to create courses that look stunning, it is easy to forget that you have to also teach your audience. Ensure you arrange the various on-screen elements so that learners don’t have to hunt around for information. Ensure that the most critical pieces of information on the screen stand out. Is there enough white space on the screen? Optimizing screen real estate does not mean that you cram every available square inch with text or graphics. The screen will look cluttered and searching for information will be akin to hunting for a needle in a haystack. Besides, a crowded screen can overwhelm the learner and scare him away altogether. Create an illusion of space by keeping enough white space on screen. White spaces provide breathers to learners and create opportunities for them to pause and reflect on previous learning before moving on to the next nugget of information. These negative spaces eliminate clutter and distractions and help learners focus on the most important pieces of content. Have you created the right mood? Use illustrations and customized photographs that match the mood of the content. Use graphics that appeal to the learners’ emotions. 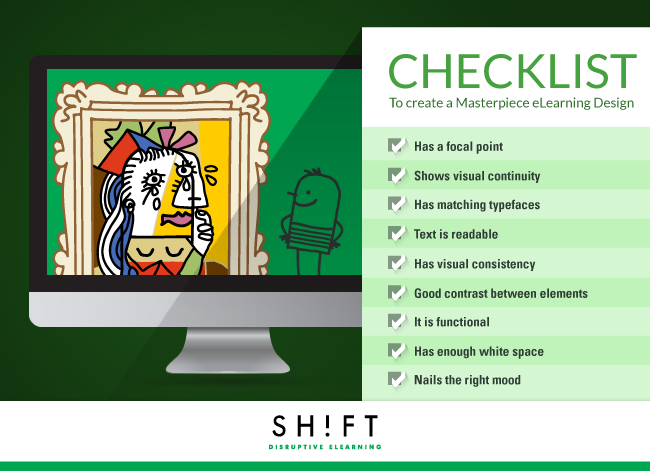 Use visuals that convey a clear meaning even without the support of the text. Use colors to set the mood. Learn more about color psychology here. Not all great designers are born. You can learn design skills by following the works of the masters, from experience, and by getting into the shoes of the learners to gauge what motivates them to keep going through a course.